If your nursing dog isn’t producing enough milk, the newborn puppies can find it difficult to satisfy their needs in a crucial moment of their lives. There are many ways to get around this problem, but we’ll start from the most obvious and then explore some alternatives. First and foremost, ask a veterinary professional. Online resources are great nowadays, but you can never be too sure with your puppies’ lives on the line. Make sure you use the right treatments and always follow the instructions of your veterinary clinic without deviating from them. Once you’ve done that, you can explore some of the solutions below. Why is Your Dog not Producing Milk? It’s important to ask yourself why your dog isn’t producing enough milk in the first place. How many puppies did it breed? Are there more puppies than teats? Is the nursing dog in good physical conditions? These are important questions that are going to help you figure out a solution. These problems can be caused by many different variables that you should always keep under control. Always try and figure out what your dog feels like and look for professional help if you can’t understand it on your own. Usually, nursing dogs at this stage require a lot of support. Supplements like Bullyade help them recover their strength and produce more milk for their new born puppies. All you have to do is sprinkle one scoop of Bullyade on her food. In order for the nursing dog to produce more milk, it needs to be hydrated at all times. You need to take care of her as if she was your own child. Make sure that she gets rehydrated as much as possible during a time where fluids are constantly being taken out of its body. If you can keep the new born puppies under control and you feed the nursing dog correctly, you will see improvements over the next few days. Make sure to keep the puppies away if they’re overwhelming the mother and try to rotate them if they are too many. 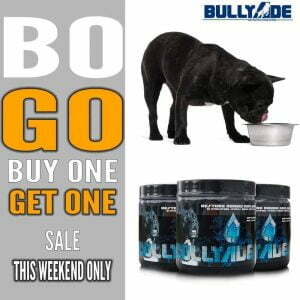 Use Bullyade to replenish your dog’s energy and rehydrate it correctly. This is a quicker and safer solution than any other supplement out there as it gives the nursing dog all it needs to produce new milk and keep a healthy condition while feeding so many puppies. Note: Some older dogs don’t take to new flavors in their water; Don’t worry just add the vitamins into their food. Never leave anything to chance. If you’ve tried rehydrating your dog your own way and it doesn’t seem to work out, immediately contact a veterinary. Ask them to come directly to where the nursing dog is feeding the new born puppies. It’s extremely important to do things the right way without using the wrong supplements. Never feed the nursing dog food that was made for humans during the lactation period. Feeding dairy products could cause mothers milk to become too rich. Generally, make sure that the dog receives the right number of vitamins and things will work out naturally. Always count the vitamin intake of your dog and compare it to the recommendations that your veterinary will have given. A lactating dog needs at least 17% of fat daily, and its general intake should increase by 20% for each puppy it is feeding. If you’re not sure how to properly count this type of data, Bullyade can help you measure it effortlessly. In fact, the supplement provides all the necessary things that wouldn’t otherwise be found in traditional dog food. Just like humans, the dog needs a whole range of proteins and vitamins that help them complement their activities and their system. Lactating dogs, in particular, require special care, with particular attention given to how many proteins and how many vitamins they are ingesting. You should always try and stick to the above-mentioned scale closely enough. If you can’t find a way to provide the nursing dog with fresh ingredients, make sure you use supplements that include all the necessary vitamins and proteins. Bullyade is the perfect vitamin supplement for a lactating dog. It has all the necessary nutrients to keep your dog hydrated and well-nourished. What if the Nursing Dog Experiences Lactation Failure? Lactation failure can be a scary problem if you’re new to the world of breeding dogs, but it’s actually quite a common occurring. Unfortunately, the mother can at times feel frightened and simply stop secreting milk in full, making it impossible for the puppies to get what they need. Unless caused by a hormonal imbalance where the nursing dog’s breasts do not develop, this is usually a temporary issue that can be solved by staying with the mother and showing her love, feeding her and restoring her appetite. If you’re able to stay with the nursing dog and reassure it, there’s a good chance that it’ll stop producing the epinephrine hormone which keeps it from lactating in the first place. If that happens, make sure to use supplements like Bullyade to replenish her nutrients and vitamins. Lactating can be a very stressful experience for nursing dogs, and they need to feel like they are always cared for, no matter what the situation and the moment. Once the initial stages of fright are gone, things should start getting more stable and you can go back to the ideal diet. Remember to use Bullyade as soon as the nursing dog will start lactating again to complement its system and provide as much milk for the new born puppies as possible! This is a great way to help the mother feel more comfortable with the process. When all of the above doesn’t work, you have to feed the puppies either with a natural milk replacement or try to pump the milk out on your own to later feed it to them by hand. This is the last resort and it should only be done when there seems to be no other solution. Again, we recommend talking to your veterinary before going ahead and starting this procedure. They might have some useful tips on how to prepare the natural milk replacement and what products are best for the purpose. If you choose to go this route, always keep the Nursing Dog involved! Don’t make the nursing dog feel like it’s not an active part of feeding the new born puppies. There are plenty of milk replacements on the market but make sure you check out which one makes the most sense to your situation. Bottles are the safest way to feed whelps when they’re not directly being fed from the mother, so make sure you buy one that’s ideal for the purpose. Always keep the bottles at a 45 to 60 degree angle and keep an eye on the mother while you are feeding the puppies. If you’re lucky not to have this problem, you can check out Bullyade to offer your dog the most nourishing and complete nutrition supplements on the market. Dogs react very positively to it and they seem to relax after just a few meals. Try it now!